Cinque Terre is ever increasing in popularity among tourists, and its easy to see why. The UNESCO World Heritage Site is made up of five towns built into the cliffs overlooking the sea. From the brightly colored houses to gorgeous views and fresh local cuisine, this area in northern Italy has a lot to offer. The five towns are linked by hiking trails, allowing the active traveler to reach each one by foot. If staying in the Genova area, you can reach Riomaggiore by train. Once you arrive at the train station, head South to visit the town. For those who are up for some walking, before walking throught the tunnel that brings you to town, take the elevator you will find on your left. Take the elevator to the top floor, then walk up the stairs to see the fortress. From here you can walk down through the town, (perhaps stop for a coffee or gelato! ), back through the tunnel, and begin walking down Via Del Amore. This “trail” is quite easy, very similar to a sidewalk. You can reach Manarola from Riomaggiore by foot, via the “Via Del Amore,” which translates to the “street of love.” The course if flat and pave, and will only take about 30 minutes. For those of you traveling in a couple, make sure to bring a lock so you can lock your love together! Once you arrive in Manarola, you can wander the town and then decide to keep walking or take a boat to see the other villages. For those who don’t want to keep walking, go down tot the port and catch a boat to see one of the others towns of the Cinque Terre. The next town, Corniglia is not reachable by boat since there is no port. For those up for more walking, it will take about 45 minutes to walk to Corniglia from Manarola. Please beware, this trail is much more difficult than the leisurly walk down Via Del Amore. The single track trail hugs a cliff, and may not be suitable for youngsters or those afraid of heights. When you arrive in Corniglia, pass the train station, and continue up the 245 steps to reach the town which sits on a pinnacle. If your legs are starting to tire, the town provides electric buses from the train station to the top of the hill. Corniglia is the simplest of all the 5 villages, there are only a few places to eat and a single panoramic point (you must walk to the point to see the best and only view). Considered the pretties of the five towns by some, Vernazza also has the most difficult trails. The hike from Corngila to Vernazza takes approximately one hour and15 minutes. 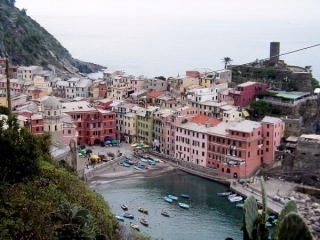 The hike from Vernazza to Monterossa takes one hour and a half. The trail is not very easy. You must hike uphill until you reach grade, when the trail finally levels off. There are numerous stores and shops to purchase picnic items in Vernazza. Don’t miss the foccaccia, a regional specialty of the northern region of Genova. Monterosso can be considered the commercial center of the Cinque Terre Villages, and is the largest of all five of the towns. There are two parts to the town the old and new (train station area). Most of the hotels are located here. The Regional trains stop here whereas only the local trains stop at all the other villages. To hike the entire way from Riomaggiore to Monterossa takes 5 hours without stopping. You must purchase a ticket to enter the park. There is no camping allowed here and the trail is not good for mountain biking. We suggest you break up the hike rather trying to do the whole north to south loop in one day.